From the Warp: Do you even need to buy Imperial Aeronautica? The other week, I talked about how excited I was about the upcoming Imperial Aeronautica book. It promised updated rules for lots of flyers along with two new flyers as well. As I was going through one of the larger forums out there, I found a thread that put it in a different perspective. All of the rules for everything other than the two new Imperial flyers (The Space Marine Storm Eagle and the Avenger fighter) are already out there along with their updates. 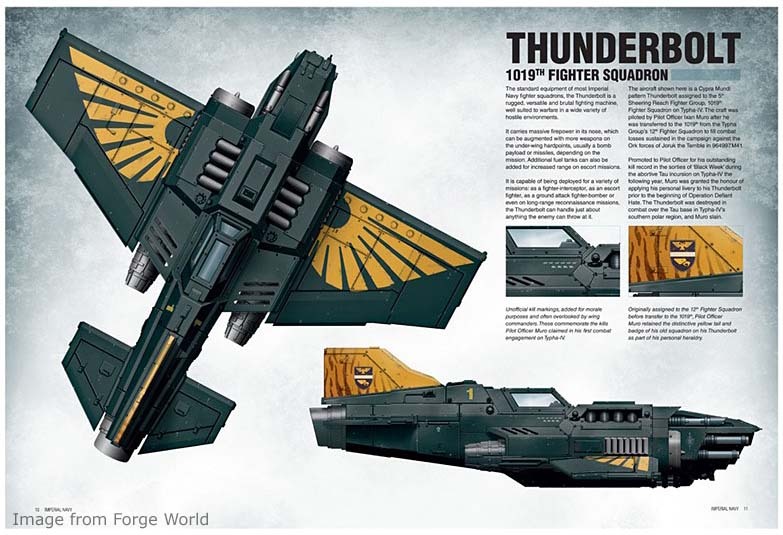 That's right, the rules have already been published for the flyers in the previous Forge World books and Forge World themselves have recently released a whole set of updates to bring their stuff in line with the new edition. Sure the book might have some additional rules that add some "cool" aspects to flyers, but I don't know how "official" they'll be. The official part never bothered me before, but if I already own the rules and Forge World has put out their 6th edition updates on their site, do I really need to buy all the same material over again? So I went looking to see what I could find. I already own the previous Imperial Armour books and I suspect that if you're a huge Forge World fan like me, you've probably already picked up the one or two books that relate to your army as well. Maybe you've got IA3, The Taros Campaign since you're a huge Tau fan or IA4, The Anphelion Project since you love Tyranids. The point is, if you've already got the one or two Forge World books that have info on your army, you've got everything in the new Aeronautica book already. I think I'm going to pass on this one for now. I've already got the Marine flyer rules and the free Forge World updates. I may get the book later on for the artwork and background info, but I'm not rushing out to pick this one up. If you're looking for the free Forge World vehicle updates, they can be found on their site and I've got a copy of them here as well. While I don't think the book is a complete waste, I am kinda bummed that it won't have more new stuff in it and it's really just a collection of stuff that's already out there. The only thing in there I needed was the Sabre platforms, but as you've pointed out, those rules were in the PDF update. For me, it depends on what "updated rules" actually _means_. If it means they've redone points costs... I'll probably pick it up. Scott: I honestly don't know if they are going to be temporary or not. I'd be inclined to think they are a bit more permanent since FW has also posted updates for Allies and psykers as well. As for the points cost, there are no changes to those in the new updates on their site. All we have are the adjustments they've made over time through other errata they've posted. Corvinus: FW has the contents page posted on their site so you can see what's in it. The majority of the Space Marine flyers that are in Aeronautica were already published in IA2. Da Masta Cheef: There you go, a simple update and you're good to go. Which is kinda nice in a way since it helps those folks who have invested the money in the previous books. Rushputin: Very true. "Updated" could mean a number of things. Kinda like "pro-painted." Either way i'm not too fussed how much new rules are in there, the books have all been worth the price so far and as this is more than just a rules book (for example like the IA Apoc books) it should be well worth the read. Sam: The only Necron piece listed in the contents of the book is the Necron Pylon. It's datasheet is already published in the GW Apocalypse book. Rictus: I agree. The art and story alone can be worth the price of the book sometimes. I suspect I'll get a copy eventually for that reason, but as far as needing it to field flyers... nope. jim: Ahhh, the constant debate between want and need. As far as wants go, this is a good one, but need this, not so much. jim: If I thought it would do the job, I would have used anything last week to include greenstuff. All is going well at this point. Not to sidetrack the conversation, but we now have a new roof and work is beginning on the inside of the house this coming week. I miss updates like the ones the released for IA1 & IA2, those might have work as well for the Apocalypse books. Aeronautica & Apocalypse 2nd ed. had nothing special to them. Anon: I tend to agree and think the updates are nice. Once you own the book, I wouldn't mind periodic updates (in the form of PDF downloads) to keep the books current. Sam: According to the contents page of the book... that's all they get in this one. EllisW: I'm sure the artwork and the campaign stuff in the back is top notch as always. It's just the reprinted rules that leave me wondering why. Now that I have a copy in my hands, I can tell you that there are updated rules and point costs in there. So, this is _very_ much the same thing as buying an updated codex for your army after two editions of the game have been released. It's ForgeWorld, so there's already a certain frivolity involved, sure, but that's the "why": the same reason you bought a copy of the most recent Space Marines codex (though, with the gap between the editions some of those rules were written for, Grey Knights or Space Wolves might be a better example). Rushputin: Excellent, thanks for the info. Have you seen the FW vehicle downloads available on their site? Flyers are included in that list as well. I wonder what the purpose of those are then if it's not to bring all of their stuff up to 6th edition. 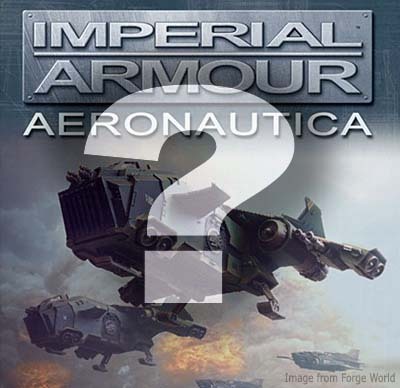 Aeronautica's the first Forgeworld book I've shelled out on, primarily because it enhances a new aspect of the game, in need of additional content ASAP, for many races all at once. I see it as an entry level book, bringing FW goodness to the tabletop in an easier-to-swallow package than the IA tomes. I've always seen them as for Apocalypse only, or for factions that I've not touched. Aeronautica's turned up at the dawn of 6th Edition, bringing the mature FW flyers into the game in a package that plugs easily into the new ruleset. And with the idea that FW content may become more mainstream, it's a gateway into their realm for players who have previously stayed away. Union Jackal: I like the previous books and see them the same way you see this one. But I understand what you're saying. If your biggest problem now is picking which flyer to include, that's not too bad. There are worse out there. Anon: Good question. I don't know unfortunately. It's not listed in the FW updates that are available online. Maybe someone with the book can give us some insight. In the sidebar, it says that it's also treated as a Super-Heavy Flyer (Hover Mode), with a max move of 24"/a turn. Thanks a lot for the answer.Should be getting my book 2morrow.